Having recently picked up my first DNF at the Canyons 100K (ugh) and with my focus on the Tahoe Rim Trail 100 mile (woohoo!) I wanted to run the San Francisco 50 miler pretty hard but still conservatively. I have never broken 10 hrs in a 50M before and I was thinking it may be possible here. Going into the race, I was feeling strong and knew I was getting into pretty good shape. The DNF at the Canyons woke me up. I took hard look at my life, training and what I wanted to do running-wise this year vs fitting it into my life. I knew I was taking the TRT100 too lightly up until that point. I ultimately decided to bear down, work more vert into my training and get after that "hundo"! The San Francisco 50 Miler is in my backyard so I was able to get a good night sleep in my own bed and make my way to the race casually in the morning. Although, i might have been a bit too casual as I missed the start by about 1:30! Ha! 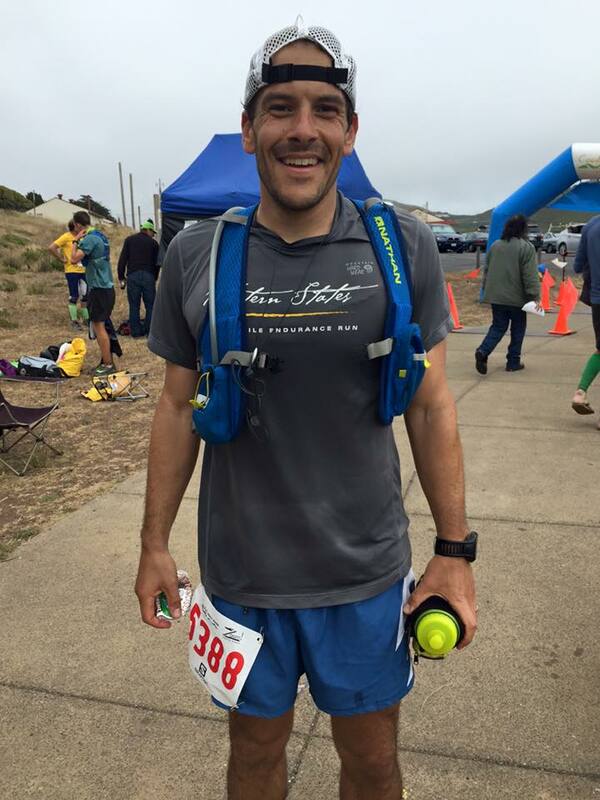 Coastal Trail Runs are pretty relaxed so it wasn't a big deal and it actually was a nice feeling to start the race in last place and just focus on running based on effort. I settled into a comfortable pace for the first 7-10ish miles. I know this course very well so I had a pretty clear picture of where/when I wanted to crank down or let up on the pace. I caught up with a bunch of people pretty quickly and settled into the middle of the pack by mile 7. I started to push a little harder running down Marincello into Tennessee Valley but kept in mind the long way we still had to go. I was hoping to hang around this pace until the turn around at Stinson Beach. From Tennessee Valley to Stinson Beach I caught quite a few people and felt great on the downhills. I was running based on effort which was still a comfortable push. I was a little discouraged at a few points just before descending Steep Ravine to Stinson Beach because I seemed to be on 10hr pace and I didn't think I would be able to speed up and remain comfortable. My plan for the second half was to remain in control but push consistently harder than the first half. I noticed that my downhill running has greatly improved this year and I was able to push the pace a bit on all the downhills all the way into the finish. After the first big descent of the second half I was on sub 10 hour pace and feeling strong. 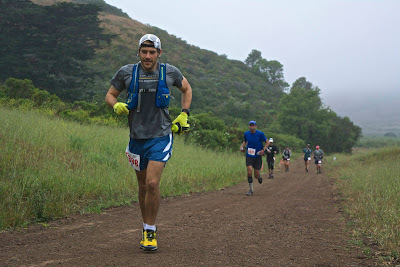 I cruised into Muir Beach aid station ready for the steep climb and the awesome single track of Coastal! The climb up the stairs just past Pirate's Cove is always a grind but I was sure to keep pressing forward while conserving energy for the last very-runnable 8 or 9 miles. I was steadily picking people off until the finish and ended up in 12th in 9:37 (*interesting to see in the Strava deets below that I wasted 20 min+ in aid stations and 1 bathroom stop, i'll have to work on that!). A 50 mile PR!! I was running in Altra Lone Peak which are my favorite shoes (especially the 2.5's). I fueled mainly on GU Roctane Lemonade flavor, some Thermolyte MetaSalt tabs and a steadily-half-full hydration pack w h2o only. I also used a few bottles of Skratch in the bottle I carried along.